What is this place called? How do you pronounce it? How many animals are here? What kind are they? About 45 different animals reside on the property including: camels, giraffe, leopards, chimpanzees, alligators, parrots, white rhinoceros, and zebra. Why do you have these animals? These animals were born in captivity or come from unfortunate situations and couldn’t survive or legally be released back into the wild. 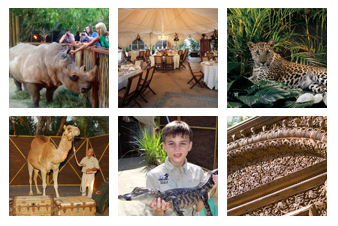 Hosting private events, a percentage of the monies made this evening will directly affect the care and feeding of our animals, as well as to help fund the children’s programs that we give to help stimulate children’s interests in animals and conservation. How much land is NGALA® Wildlife Preserve? NGALA® is compromised of 42 acres. Do the animals live in cages, or are they free roaming? We have both predator and prey here, so we have to be careful not to let them get too close to one another. Many of the animals are also solitary by nature, such as the big cats. We have all natural environments created for our creatures including exercise facilities to ensure they stay healthy and happy. The animals are maintained just out of site from the guests, this is done so that we can create different themes and experiences by utilizing different animals to ensure that our animals are not on display all of the time. Why don’t we have more animals on display tonight? We have many animal programs and experiences, which are provided depending on the wishes and needs of the client. How many people can you entertain at once? We can host groups up to 1,200 guests. Call of the Wild Catering Company is the exclusive Caterer.